Some fugitives preferred to find refuge in Montreal instead of Canada West. On the night of Wednesday, February 12, 1851, John Caphart, a constable from Norfolk, Virginia, arrived in Boston with legal papers and a power of attorney from fugitive slave Shadrach Minkin's owner, John DeBree. Caphart was a man who had a "hard, bad face, and ugly, not only in form and feature, but expression," a face "made for a slave hunter, or by his business." A plan was put into place. Early on the morning of February 15th, U.S. Marshals would surprise Minkins at Taft's Cornhill Coffee House where he was working as a waiter. However, the man who was to identify Minkins did not show up. To avoid suspicion, two of the marshals ordered coffee. Minkins waited on them. When he went to get their change, two other marshals came in the shop and seized him. They rushed him out a back passageway and into the nearby Court House. But witnesses had seen the capture, and news of it spread like a wild fire. Within thirty minutes from one hundred to one hundred and fifty people, most of them angry black men, crowded into the courtroom. Members of Boston's Vigilance Committee hurried to Shadrach's side; a team of lawyers rallied to his defense. They prepared a habeas corpus petition to protest his arrest, and they obtained a three-day postponement of his trial. Marshals began clearing the hostile crowd from the courtroom. One man went over to Minkins and told him, "Don't be afraid; we'll stand by you." The man was immediately removed from the room. Minkins vowed, "If I die, I die like a man." Meanwhile, a crowd of men outside the courtroom was growing bigger. Suddenly, fifteen or twenty of the them pushed open the outer courtroom door. Led by Lewis Hayden, who had escaped from slavery in Kentucky less than a decade earlier, the men raced to Shadrach to rescue him. They seized him by his collar and feet and took him out of the Court House and down the street to Beacon Hill and hid him in an attic. Shadrach was transported in a wagon to Concord, then to Leominster, and on to Fitchburg where he was put on a train which would take him across Vermont to Montreal, Canada. He may have traveled by train to Burlington and St. Albans and from there to Montreal via St. Johns. Boston abolitionist Samuel Gridley Howe reported that when Shadrach got into Vermont, "he fell down upon his knees and poured out his fervent thanksgiving to God in a manner to draw tears from the eyes of my informant who was with him." DEAR SIR: - I feel it my duty to forward you the account of my arrival in this city. I reached here last Friday evening, a journey of four days. The weather was very severe during the time, and we had to cross the ice twice; once the distance was nine miles. My health is not so good as when I left, but I hope a few days will restore me. I am at a loss for words to express the gratitude I feel to those kind and dear friends in Boston, and believe me I shall always consider it my duty to pray for their health and happiness. Please to remember me kindly here, - and to the ladies. And in conclusion, permit me to subscribe myself.Your greatful servant. Lewis Hayden and a number of other men who were arrested and charged with aiding Minkins in his escape were acquitted. Like the Biblical Shadrach who was cast into a fiery furnace and came out alive, Shadrach Minkins escaped from slavery and survived. It took a while for him to get settled in Montreal, but before long he had a job waiting tables. Soon he had his own lunch shop. He swore he would never return to the United States. He met and married a young Irish woman named Mary, and they started a family. He gave up his restaurant and took up barbering. It was a good trade because it provided him with a steady income. For a full account of this exciting story, we recommend Gary Collison's Shadrach Minkins: From Fugitive Slave to Citizen (Harvard University Press, 1997). Boston Commonwealth, Mar. 29, 1851 and The North Star, Apr. 10, 1851. Boston Daily News, Feb. 17, 1851. 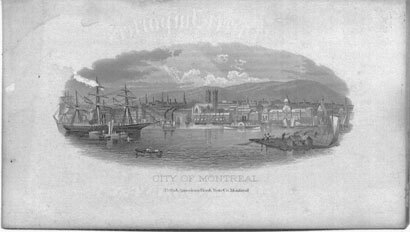 City of Montreal image, Special Collections, Benjamin F. Feinberg Library, State University of New York at Plattsburgh. Broadside Collection, Rare Books Division, Boston Public Library, cited in Gary Collison's Shadrach Minkins: From Fugitive Slave to Citizen (Cambridge, Massachusetts, and London, England: Harvard University Press). Lewis Hayden image, Boston African American NHS, NPS Photo.